Congratulations on a race well run, Joe. I am so impressed with the work you put in for this and for not letting the conditions get you down. Great job out there. Hi Ann! Thanks so much for the message and the kind words. It was a tough day, but a great day nonetheless. If we pick this as our “sport” I think we have to grow a pretty tough skin if we expect to keep getting back up off the canvas and trying again. There’s no shame in failing, just in not trying our best. Take good care! this makes me tear up, Joe! hell of a race, and to know that you couldn’t have run it a second faster is really an achievement to be proud of. wonderful writing, and i love the photo of joan and lance. last but not least: a hearty CONGRATULATIONS! Thank you Rachel! Really appreciate your kind words and support. It was an all-star cast there yesterday. Just amazing to be competing with so many amazing athletes and so many cancer survivors. Truly a great day. Congrats again Joe. You ran the race you trained for. You were there for the first 11. The fact that no one from the 3:00 pace group finished with the pacers tells how tough it was (did the pacers finish in 3?). You dedicated training allowed you to get to 3:15. Way to leave it all out on the course. Great job. What an inspiration! Hi Matt! Thnaks so much for the message and the kind words. One pacer Roger Isern came in with a time of 2;59:37. The other, my friend Scott Graves who tweaked his calf the day before the race dropped off late and finished in 3:08 and change. Was a tough, tough day for sure. We each must accept that we are no longer “middle of the pack” marathoners. Chew on that thought for a minute. I like the taste. Logan – thanks so much for the message and the “reality check” if you will. I guess we are running with the Lions in some respects right now. I know that when the calendar flips to a later chapter I’ll be running slower and trying just as hard. I’m sure the clock won’t mean as much as the effort then. I need to remember yesterday’s race when that time comes. In the end – it is the effort that matters. Again I ask you Joe: why you gotta make a grown man cry?! That is a SOLID race report. I followed you on the iPhone app as I was out and about during the day and knew 3:15 was not your “A” goal. But I also you that your time would NOT be due to a lack of effort. Inspirational performance as always! Congratulations! Mike – I think it’s the tears that make the marathoner. If we’re not ready to risk crying from time to time, we’re not wired correctly for this sport. It takes every ounce of effort and emotion to get to that line – you are a fierce warrior and tremendous athlete …. the tears come with the territory. Thank you Mike both here and over on DM for all your support. You are the man. Chanthana – so great to hear from you! Thank you for the kind words both here and on Daily Mile. You simply are the greatest. Best to you C! Jill – thanks so much for the message, from someone who has been along since the beginning I love that you feel like I gave my all out there. Thanks for everything! What an amazing report. You had some great experiences. While you did not achieve your first set ideas I love the fact that you are so positive with how it turned out!!! Thanks for inspiring me and so many others! Hi Jennifer! There were far too many victories yesterday to outweight the struggles. It was a great, great but challenging day. Thanks for all the great love and support. You rock! Thank you Nancy! Bets to you this summer as you get ready for NYC. I’m already looking forward to that race in November. May my good karma from yesterday bring us cool tems and the wind at our backs. Hi AJ! Thanks so much for visiting and all the great love and support coming from LA. You guys rock. I really hope we get to hook up in NYC this Fall – now that is going to be a great closing mile. I can see making the turn at Columbus Circle in my dreams right now. Your training is looking great AJ – so excited for your first marathon. It is going to be an amazing experience – try to enjoy everything about it – even all those training miles. Best to you and R! Simply amazing…great race and i thoroughly enjoyed your race report! If I can get it together for NYCM 2011, maybe we can push each other to a 3:00 finish! In the meantime, I know Dom is looking down, smiling, impressed, touched. You are special my friend. You are special. Oh my goodness Matt – that sounds like a TERRIFFIC plan for NYC this year! Would be honored to run with you at any pace. Thanks so much for the kind words. You Sir are the greatest. No surprise, but it’s evident from this post you attacked the course with all you had, both mentally and physically. It’s been a privilege to see you put in the work, lay it on the line and go the extra mile for Dom’s family. No doubt he is proud of your selflessness. I hope we’re able to get together at the CRB. It would be great to finally meet you in person. Awesome, awesome job, and great race report as always. Enjoy the moment! David – thanks so much for the visit and the kind words. You have been such a great friend and supporter. I can’t say thank you enough. Thanks for a super race report, and congratulations on an excellent run. I ran the marathon yesterday as well. It was my only my second race of any description, ran 3.26 last year and 3.19 yesterday. I had thought that the difference was down to my exuberance last year, the adrenalin fueled first race, because yesterday was so incredibly tough in comparison. Miles 22-25 were so difficult it was laughable, and I too had a laugh as one gust of wind after another threatened to push me backwards. But I too came though it, ran a 7.36 mile 26 to sneak in with a Boston qualifying time by a minute. I am so glad that you talked of the tears at the end. I was also overcome by emotion at the end. Not through a sense of achievement, but, as you said so eloquently, by knowing that I could not have run a second faster. Not a single second, and that, surely, is the purest definition of the perfect race. Simon – Congratulations to you my friend. Just an amazing performance in some really challenging conditions. A BQ on your second attempt! So very impressive. You left it all out there on the course, and no matter what the clock says, I think you ran a lot closer to a 3:10 yesterday than a 3:20. Many Congrats – hope to see you in Boston! The marathon is so hard and so hard to plan for. What a great effort Joe. One suggestion for your relay–Have fun! You will have so much fun. It is hard to explain to someone who has not run a relay. I can’t wait for you to confirm this when you finish it. Trey my man, I thought of you often on Sunday. It really got tough in a few spots and I thought of how you hang tough in your ultras and just never give an inch to the course. I tried to stay as sharp and focuses as I could and just stay in the mile. A finish line has never looked so good Trey. What a race. Thanks for the advice on this weekend’s racing out in Ragnar – I intend on enjoying my 18.8 miles, but I am really going to love the 181.2 that my teammates run. It is going to be a blast. Best to you Trey! Joe, again, another stellar race report. That one…that one darn second…think deep….that was Dom. It was his way of letting you know that you are and always will be the ONE to continue his legacy and to continue to inspire many including your family and his. You are #one in many people’s lives. Cherish it! God bless and God bless Dom and his precious family. Nina – thanks so much for that – there is definitely something “karmariffic” about that single second …. I’m sure you’re right. Dom was there for the ride on Sunday, no doubt about it. Can’t wait to see you this week out at Ragnar. We are going to have a great, great time. You’ll be handing off to me after your second leg. I’ll be waiting for you with the biggest smile you’ve ever seen. Take good care and safe travels out to the race. Another perfectly executed race and well written report. Those conditions were so rough out there I didn’t even have the guts to try for a PR – my goal was to make it through in one piece (I have a history with warm races). I was impressed a) that you went out goal pace anyway b) that you had the sense to re-adjust and c) you still smoked a PR. That race had all the ingredients for a nasty crash and burn. Nice job – can’t wait for your next race. Hi Sean! Thanks so much for the message and the kind words. Congrats on bringing that race home in 3:28 and change. You were out there fighting it all morning, so I know you know exactly how tough a day it really was. A finisher’s medal never felt so darn good. I’m looking forward to the next one also! Can’t be anything like Sunday right? 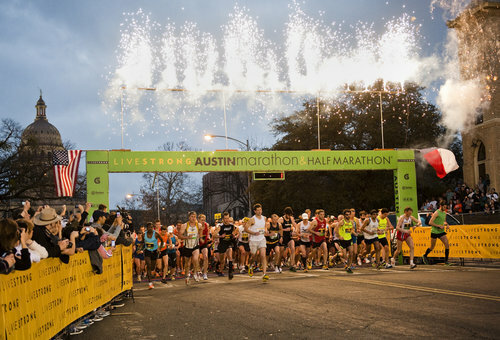 Are you going to be running in the Cap 10K? 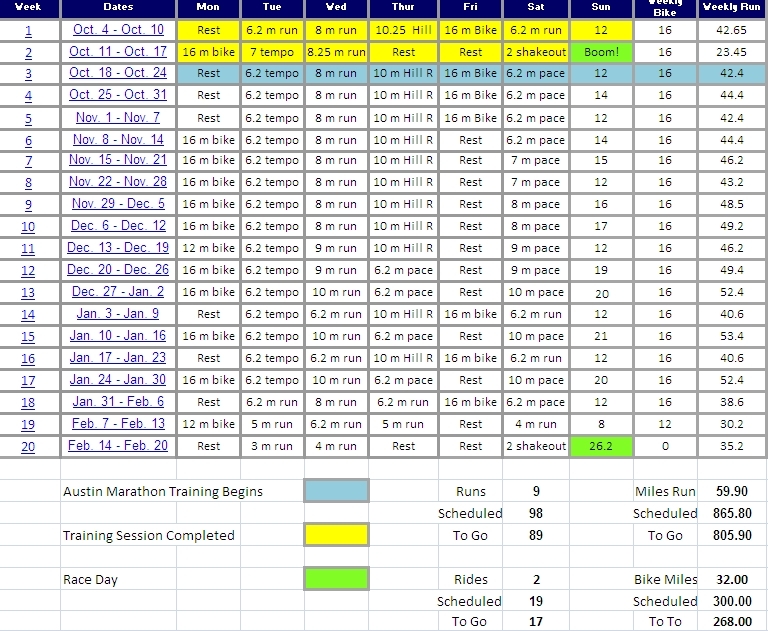 I do need a March race (I have a little consecutive monthly race streak) but trying to decide between a few options. Really just want to recover from Austin and put in a solid effort in Boston in April. I’m a little more sore than usual. Sean – completely understandable … hard to think about another “A” race right now. Best to you at Boston – that was such a great experience last year. 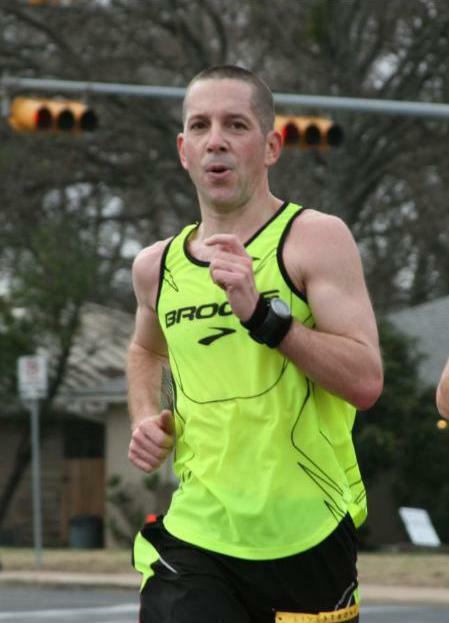 I wish I had raced better, but I learned a lot for 2012 (I hope I can get in with my time) – Let me know if you do decide to do Cap 10K – would be great to hook up pre/post race. Joe, that was a fantastic race report on a race well done. You were smart about slowing down in time to still chase down a PR, rather than completely blow up — and that takes a lot of guts. Dom would be so proud. Hi Layla! Thanks so much for the message and the support. It was certainly a good call on my part to adjust when I did. A lot of runners were not so fortunate on Sunday. Thanks again for everything! You SERIOUSLY killed it! I’m very proud of you. Great job! Hi Courtney! You’ve been such a great supporter it is awesome to hear from you today! We definitely did what we set out to do on many fronts. Very, very satisfied with the race. Take good care – hope you are doing great! You demonstrated integrity, guts, and dedication out there on Sunday! It was truly an honor to watch my “coach” and the man I consider one heck of a running God crush that final 2/10’s of a mile! I wouldn’t have missed it for the world! Thanks again for everything! It is an honor to call you my friend!! Jodi – I can’t begin to tell you how cool it was to see you, Deb and Jeni H. at the end of the race. It’s hard to find the words to describe the feeling trying to run every single stride just as hard as you can over those final 400 meters after 3+ hours of battling the hills, the course, the distance and the wind. You guys took :10 seconds off of my PR for me at least as I was really able to let it all hang out. That’s what it should be about for us as we’re never going to “win” anything … it’s just about doing our best and not leaving anything on the course. Think about that closing 2/10’s when you run your full this year in Ohio. Those will be the greatest 2/10 of a mile you ever run. Thanks for everything Jodi – it was so great having you down for the race. Let me know when you want to talk about that training plan, I’d be honored to put one together for you. Nice report, Joe, I actually found this post while searching for Boston news. Congrats on getting in! Austin was was a tough race. I started out slowly and ran a negative split of 2 minutes to finish in 3:17 Looks like I did just the opposite of you. My 3rd time running the home course, too. If it’s any indication of what most of use were capable of with better weather, I turned around and ran a 3:07 in June 2011 at Marathon to Marathon in 50 degree weather.